Coupons are all the rage right now. And, rightfully so! It's amazing how much free and very cheap items there are out there that you can score with coupons. I'm having a blast using coupons to stock up on toiletries our family uses (toothpaste, toilet paper, shampoo, soap, floss, dish soap, etc.) AND toiletries I can give away. I don't have enough storage space to accumulate a huge amount of surplus. If you live in a very old house, too, you know why. We have limited storage for even the important things like clothes! This prompts me to put a bag together for a friend or to donate when my shelf gets too full- and what a good thing to be prompted to do! Many people take their coupons to the grocery store and get great deals and freebies there, too. But, I'd like to caution folks to stop and think about this. What kinds of food is it that you can buy with coupons? 95% of the food coupons *I* see (and I actually look at coupons a lot) are for processed food. Remember, it's better for your family's health if you can limit the amount of processed foods they eat so sometimes, you need to resist clipping that coupon because, as many of you know, once you have a coupon in hand, that coupon wants to be used! Here's our solution to a high grocery bill- we grow our own groceries! Now, if you're visiting my blog today, there's a good chance you already garden. But, for those of you who don't, please understand, I am not suggesting you try to grow all your food this year. What I would like to challenge you to do is, if you have space (and space includes flower beds in full sun!) 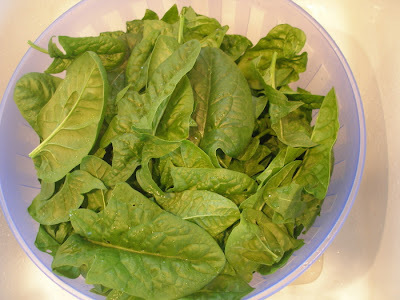 choose a vegetable your family eats a lot of and try to grow a lot of it this year to freeze. If you're feeling brave, grow two or three vegetables! Lettuces, swiss chard, tomato plants, snow peas, and others all look lovely in flower beds! Remember to plant a lot, so you'll have a surplus to freeze and store. Imagine not having to buy as much produce next winter- wouldn't that save you some money?! Even if you don't preserve any of it and just eat it, you've saved money!! We all know that the food at the grocery store that's good for us- lean meats, fruits, vegetables and whole grain products- are usually the most expensive. So, that's why we need to work on accessing them more cheaply. If you don't have garden space yourself and have friends and neighbors who do, ask if you could use part of their garden space in exchange for helping to weed or water this summer. Pick your own at local farms and preserve extras. You'll avoid those nasty pesticides and everything will taste so much better. If you can't grow some of your food, use coupons to get most (if not all) your toiletries and household items super cheap or free and then transfer those savings to your grocery budget so you can buy local and/or organic produce at a farm stand or at your grocery store. Coupons can be an excellent round-a-bout means to buying healthy food! Be creative and remember that just because it's cheap or free doesn't mean you should bring it into your house. That's what the manufacturers want to have happen. They want to get you hooked or their imitation food. Instead, get hooked on real food that will build your health instead of tear it down. So, if you can, go on and get planting! Just out of curiosity... where do you get your seeds? Do you use heirloom varieties? Do you save seeds? When you first started your garden, what did you use to amend the soil? Do you use raised bed gardens? Sorry for all the questions... we gardened extensively in the past but moved to a different part of the country last year and are looking at putting in garden beds. We will probably put in some raised beds as well as a small garden plot plus some fruit trees even thought they won't bear for a few years. Thank you for all the information you share on a regular basis! Well said! We are still eating thru last summers strawberries, raspberries, blueberries and blackberries (Yes, we like berries :) I think I'm going to try Fava Beans this year... something I haven't planted in over 15 years... I bet they'd be good to add to the freezer for winter soups. I totally agree about using coupons for food items. I just wish they had them for fruits and veggies. ;) But, that is why we choose to garden as well. I do need to learn how to better utilize the occasional coupon for toiletries though... Great post! Good thinking...I have yet to make this coupon thing REALLY work for me...but I do use them and they do help...every little bit, right? We save some of our seeds, particularly those that are easy to save like lettuce, bell peppers, some tomato varieties, etc. The seeds we buy come from a variety of places (local garden stores, seed catalogs, etc.). We have bought some heirloom varieties in the past and those we particularly try to save (the seeds). We don't use raised beds. Our first year gardening, we noticed that one corner in particular of our garden had a lot of clay in it. We used a tiller to work the whole garden up that first year, but do not use it every year. We prefer not to disturb all the worms and their tunnels:-). Over the past 6 years, we've added a lot of organic matter to the whole garden- we mulch with straw, grass clippings, leaves, chicken droppings, shredded paper, etc. As all this has broken down, it has improved our soil greatly, especially in that clay-y corner. I hope I answered your questions- keep 'em coming:-). Thanks for the post! I've found that most of the coupons are for processed food-ugh! But, your post reminded me of all the paper products...that I can save more money on. We're still trying to use of freezer food & root cellar jars...but I'm motivated to plant this year---especially as food prices are going up, up, up! Fresh/frozen veggies and fruits are awesome. However, most food banks aren't equipped with ability to handle frozen foods. This time of year they are always short of protein sources (beans, peanut butter, tuna, etc...) and canned veggies. So while we eat out of freezers maybe we can use some of our food coupons to help our neighbors. Wonderful thoughts. I don't enjoy the coupon game very much because they are mostly for processed foods that I don't want. I wish I could grow tons of veggies this summer, but my space is small. I'm determined to try though! I must work harder at growing things in our backyard. It's so shady that we haven't had great success, but I'm sure we could do something with greens in the spring and fall. And we love greens. Thanks for the encouragement and inspiration. Great point about the coupons being mostly for processed unhealthy foods. I used to cut a lot of coupons until I realized I didn't really want my family eating 3 bags of potato chips at half price! Then I found out I could get together with my neighbors or people in my community and buy in bulk directly from a distributor. We save 40% on items that are really necessary, and it gets delivered right to our doorstep! That really cuts down on the temptation to "take advantage" of discounts on things we don't need. The hard part was getting in touch with the people who want to buy the same things we do. We now use an online tool called SplitStuff (http.//splitstuff.com) to connect and make deals, and it has been sooooooo much easier. And guess what? Taking care of the groceries online means we have more time for gardening, spending time with kids, church activities, basically everything we wanted to do in the first place. "Where there's a will, God provides a way." :) Happy simple living!